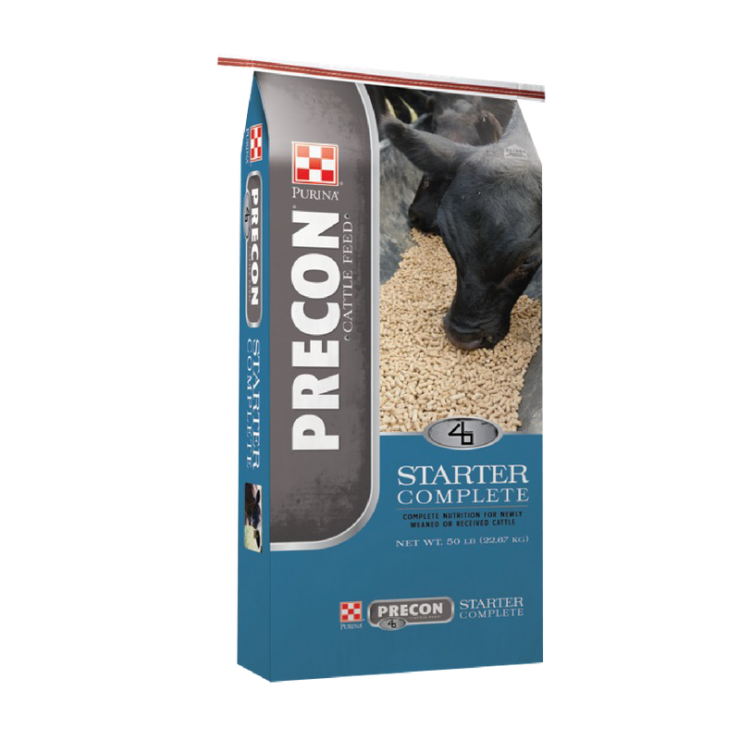 Purina Precon Starter Complete is a complete pelleted ration for preconditioning calves on farm or receiving calves in back grounding operations or feedlots. Drug options available: For health problems related to the stresses of weaning and shipping. Palatable: Encourages calves just weaned off cow and/or stressed during transportation to begin to eat dry feed and recover from the stresses of weaning and shipping. Pellet containing protein, vitamins and minerals: Formulated to provide the correct balance of nutrients required for starting calves to encourage intake, health and weight gains. Zinpro®Availa® 4: Rapidly restores trace mineral levels to support the immune system of nutritionally challenged, stressed cattle. 1. When making a ration change, allow 7-10 days for animals to adjust to the new ration. 2. Provide a source of fresh clean water at all times. 3. Do not allow fine material to accumulate in feeders. 4. Provide adequate bunk space for each animal. Bunks should be well protected and well managed to prevent feed from becoming wet and molding. 5. Manage bunks to minimize quantity of feed accumulating in trough. 6. Cattle should be vaccinated against enterotoxemia. 7. Consult your veterinarian for recommended health program for your local area. 8. Provide plain salt and mineral free choice. 9. Have feed before cattle at all times, In groups of cattle, there are certain animals that experience chronic bloat, or other digestive disturbances, and consequently are poor performers. In addition, feed consumption in excess of 3-3.5% of body weight, severe weather changes resulting in erratic feed consumption, and poorly managed feeding practices can increase the incidence of bloat in all cattle. If bloating does occur, the above management practices should be reviewed. If bloating continues, feed 2-3 pounds of hay per head per day or begin switching cattle to a growing ration over a 5-7 day adaptation period. Store in dry, well ventilated area protected from rodents and insects. Do not feed moldy or insect-infested feed to animals as it may cause illness or death.